Update: The Ravenna Alehouse was sold and its name officially changed to Flying Boots Ravenna on July 15, 2017. Historical notes: There has been a bar in this building (built 1930) since at least 1939, when it was owned by Mrs. Elizabeth Bisson. By the early 40s it was the "Friendly Tavern," which it remained through the 60s. 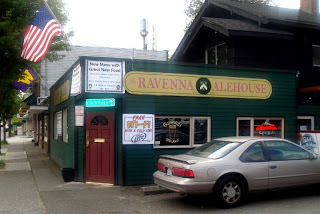 It was renamed the Ravenna Tavern (later Alehouse) at some point in in 1970 or 1971.